I had a great time at the Harrisburg Jamfest this weekend! I got to see lots of friends, many of whom played the event. It had the backyard camping feel (It originated on the promoter’s mom’s backyard) I set up on Saturday along with some other venders and it was nice to have people recognize obscure phish reference in the some of my artwork. I sold a couple prints and an antelope painting, so the weekend was successful, but more importantly I had fun! The girl that bought this insisted on displaying this all weekend! 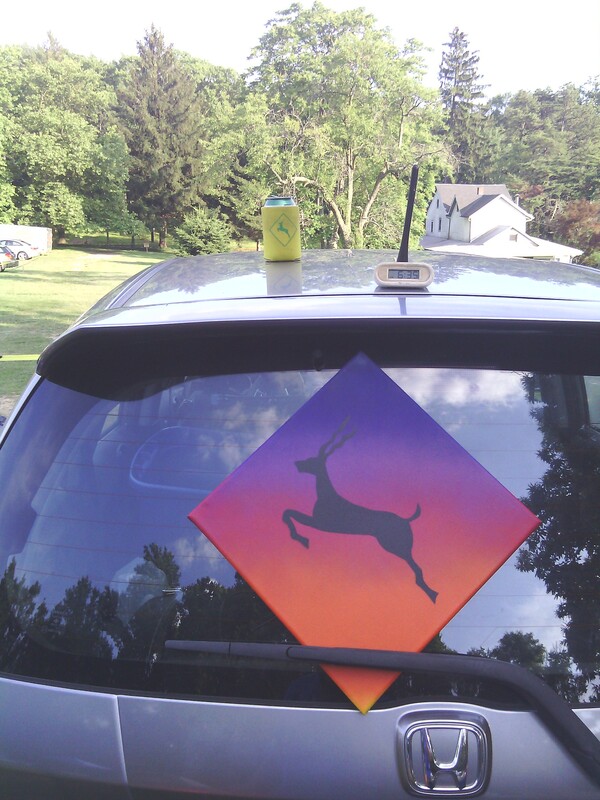 I plan to do more of these, as well as traditional yellow antelope canvases for the lots. I also sell them through my esty shop, available in whatever colors you’d like (just post a request in a comment). I’m also gearing up for the start of tour tomorrow, and on the search for a live video or audio stream. If I do, expect an illustrated setlist on wed night! SPAC might take a bit longer, since I’ll be camping that weekend, but fingers crossed I can get cell phone reception to at least see the setlist. Scouring my external hard drive, I also came upon this gem. Not directly phish related, but I had done it for a flyer for the band Great Northeast from Harrisburg, Pa (my hometown). It’s comprised of 150+ bluegrass instruments and was possibly the reason I stopped doing digital art for several years. I also have this available through etsy, and will be selling some at a small festival a good deal of my hometown friends will be performing in. An illustrated setlist of Phish’s performance on David Letterman tonight. I plan to do more, ideally for the whole summer tour. I’ll be making prints, as well as take requests for past shows to do on commission. Stay tuned on here and esty for new prints!